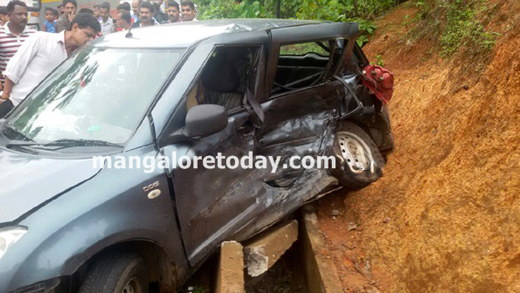 Puttur: June 15, 2015: In a tragic serial accident which took place in Puttur on Sunday involving three vehicles, two persons lost their life and three persons sustained serious injuries. The police identified the dead as Sooryananrayana (64) and Gopiinath(45) both resident of Bengaluru. Both were travelling in a swift car to attend a programme in Puttur. Eyewitnesses reportedly told police that the driver of the speeding car hit a Hyundai i10 car, and then rammed into another vehicle. Three persons who were injured in the accident and were immediately rushed to the hospital for treatment.